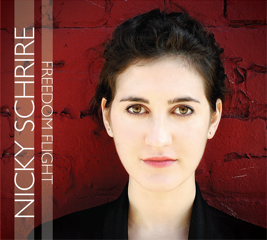 Nicky Schrire, a native of London, England, who was raised in South Africa, has issued her debut CD, "Freedom Flight" (self-released in association with Circavision Productions) - she joins Lorraine Feather, Kate McGarry, Melissa Stylianou and Sara Lieb on the list of impressive 2012 recordings. Like her compatriots, the music is successful on many levels, not the least of which is the excellent musicians who make this program shine. The core group - pianist Nick Paul, bassist Sam Anning and drummer Jake Goldbas (a native of Hartford, CT) - shows such great ease and creativity in its interactions with Ms. Schrire. This music breathes, nothing is rushed or forced. The vocalist is quite self-assured, trusts her judgement so that each piece stands out. Whether singing in Portuguese ("E Preciso Perdoar") or Neapolitan (the opening verse of Maria Pia de Vito and David Linx's "Sleep Away") or the wordless vocal of the short title track that leads the program in and serves as an introduction to Lennon/McCartney's "Blackbird", Ms. Schrire is emotionally invested in every syllable of this material. And her arrangement of the tune includes room for a bass solo. She is quite democratic in how the space she allows her fellow musicians. Tenor saxophonist Paul Jones creates a tense, almost combative, second voice on "Don't Think Twice, It's All Right" yet, by the end of the song, Ms. Schrire is singing right along with his hearty playing. On the playful "Me, The Mango Picker" (composed by South African bassist Carlo Mombelli), the vocalist sets the rhythm while the clarinet lines of Jay Rattman dance around her. Bassist Anning joins, his melodic lines and full tones a fine third voice. Brian Adler adds his percussion arsenal (cajon, shakers, shells) to the many voices of Ms. Schrire on an inventive read of Loudon Wainwright III's "The Swimming Song." Recordings like "Freedom Flight" make me glad to be alive. People might look at the song listing and say that Nicky Schrire is trying to cover too much territory, trying to prove too much - maybe she should stick to standards. To me, the word "flight" in the title alludes to "flights of fancy", of an artist spreading her wings and climbing as high as possible. The sound quality is excellent, very "warm" and spacious for a CD, in keeping with the content. Excellent program and, dear me, this is her debut recording. The CD "launch party" is set for June 6 at the Cornelia Street Cafe in New York City. For more information, go to www.nickyschrire.com. 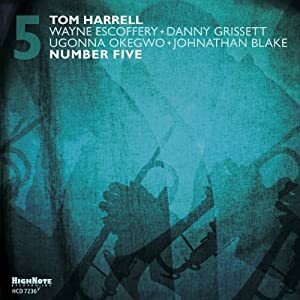 "Number 5" HighNote Records), the 5th recording in 5 years to feature the 5-piece band that trumpeter and flugelhorn player Tom Harrell has had together since 2007. Saxophonist and co-producer Wayne Escoffery, pianist Danny Grissett (he also plays Fender Rhodes), bassist Ugonna Okwego and drummer Johnathan Blake give this music great personality, imbuing the pieces with fire, grace, intelligence and substance. Add to that Harrell's fine compositions and arrangements as well as strong playing and this music shines. For this CD, Harrell has mixed things up a bit. The first track, Dizzy Gillespie's "Blues 'N' Boogie", features the leader in a furious duo with Blake, the two musicians tugging at each other, pushing and pulling and absolutely swinging. Harrell's duo with Grissett, "Journey to the Stars", is a lovely ballad with circular piano figures and overdubbed trumpets that support the leader's lyrical flugelhorn work. "Present" is also a handsome ballad, with Grissett's chiming Rhodes tones plus excellent brush and cymbal work from Blake. Harrell goes it alone on the standard "Star Eyes", 5:29 of melody, invention, and, yes, rhythm. He close the program with another solo piece, Tadd Dameron's "A Blue Time", a medium tempo ballad that most certainly is a blues but also a richly melodic piece. Harrell's solo displays a swinging feel as well as a wonderful use of silence. When the Quintet "hits", one can easily hear why Harrell is enamored with this band. Escoffery's tenor playing gets stronger with each recording, his solos filled with smart phrases and ideas (and not cliches.) Grissett, an intelligent player, and Okwego are the "glue" of the group - along with the active percussion of Blake, they give the soloists such fine support on the title track and the mysterious grooves of "GT". On the latter tune, Blake not only propels the piece forward but also engages in conversations with the soloists. Grissett picks up on the Thelonious Monk reference in Escoffery's solo and builds his solo off of it. In this section, the bass and drums move independently of the piano but never lose the forward motion. Although the CD is credited to Tom Harrell, the 5 musicians are a real working unit and this music would not be good as it is without their interactions and ideas. Put their 5 recordings in a multi-disc player, press the "shuffle" button and luxuriate in one of the best working units in contemporary music. Yes, "Number 5" shows growth and adds new elements to Harrell's vision; yet it is a continuation of the excellent road has taken since 2007's "Light On." For more information, go to www.tomharrell.com. Bassist-cellist-composer Henning Sieverts is one of Europe's busiest musicians. He has appeared on over 100 recordings including 12 as a leader (most recorded in the last decade. 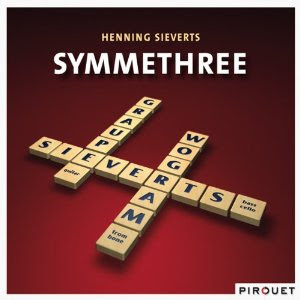 For his latest recording, "Symmethree" (Pirouet), he pares his usual quintet down to a drummer-less trio (hence the names a play on his "Symmetry" group and recordings.) Here, he is joined by Nils Wogram (trombone) and Ronny Graupe (electric guitar)for a program of original pieces by the bassist that combines his love for jazz with 20th Century European classical music. Wogram's warm tones brighten "New Tone Barn", a piece based on Anton Webern's "Kammersymphonie, Opus 21" - this music moves from edgy dialogue to a long solo section where the thick tones of the bass and handsome chordal guitar allow the trombonist to roam freely while maintaining his melodic style. "Deep, Deep!" channels New Orleans blues with with elements of "free" music and is quite an aural treat. While not as "pointillistic" as work by French artist, "A La Seurat" is a shimmering piece with a simple melody and intelligent interplay. There are moments, such as "Coffee To Stay" and "Walking On The Other Side" when this music reminds of the work of Jimmy Guiffre with Bob Brookmeyer and Jim Hall in the 1950s. Much of it is soft, there is an emphasis on melody and, while not as steeped in the blues as some of Guiffre's music, there is an importance of how each piece is framed, how the musicians are listening, acting and reacting. At times, especially "Nine On Twelve", this music swings with a vengeance but ever-so-playful. The German-born Graupe is a new name to me but plays with great taste and intelligence while Nils Wogram has worked and recorded with pianist Simon Nabotov and fellow trombonist Conny Bauer as well as leading his own groups. Henning Sieverts has done a masterful job of crafting this music so that it sounds full and rich. The compositions and arrangements hold and engage the interest of the listener. There is much to digest and you'll hear more on each return visit. To find out more, go to www.henningsieverts.de/. That should not affect your enjoyment of this CD. The material comes, mostly, from 1962 through 1971, the most prolific time of Mayfield's career, from the sensuous "Gypsy Woman" (recorded by The Impressions) to the gospel-soaked "Amen" (not an original) to "Move On Up" and "We're a Winner" (both tunes reflecting the composer's pride in the African American community) to the music composed for the soundtrack of "Superfly" (the 1972 film with songs such as "Freddie's Dead" and the ultra-funky title track.) Gibson shines on those tunes - he had been a member of Mayfield's touring group for 17 years and recorded the sound track.) Watts is a force on this music, whether wailing with intensity on "Superfly" or taking his sound to church on "Amen". One of the busiest "session" player in Los Angeles, the saxophonist always gives his best. Roney is a good foil for both the saxophone and guitar, his muted tones suggesting Miles Davis on "Beautiful Brother of Mine" or soaring majestically on "Keep On Pushing." Upchurch, who has probably been on as many sessions as Watts, has a sweet tone. His rhythm work meshes well with the more full-bodied tone of Ferrante's acoustic piano. The pianist, perhaps best known for his work with the Yellowjackets, plays with great assurance throughout the CD, either supporting the soloists or stepping into the spotlight. As for the rhythm section, they are the heartbeat of this music and really supply the "deep" grooves. For those of us who grew up with and were educated by Curtis Mayfield's musical messages, "Impressions..." is a sweet reminder of his greatness. His tunes were solid, filled with spirit, and many of his best songs sound just as fine today (with messages that still resonate.) Turn it up and let this fine music fill your house with soul. For more information, go to www.bfmjazz.com. This Friday night, Michael Bates Acrobat comes to Firehouse 12 in New Haven - I write about the gig in my previous column. Turns out that trumpeter Russ Johnson won't be able to make the performance but his replacement is the equally impressive Ron Horton. Horton, who was an integral member of the Jazz Composers Collective and had great musical associations with both the late Andrew Hill and soprano saxophonist Jane Ira Bloom, is an excellent and inventive player as well as one of the nicest people you'll ever meet. Tickets are still available at firehouse12.com. Composer-pianist-educator Earl MacDonald, whose blog "Ever Up and Onward" I recommended several months ago, has just posted recordings of his "30 Tunes in 30 Days" experiment. You may recall, he challenged himself to create 30 new blues tunes. You can hear Professor MacDonald playing these tunes with 4 of his students - Emily Lavins (saxophone, flute), Tom Lee (trumpet), Nick Trautmann (acoustic bass) and Mike Allegue (drums) - by going to www.earlmacdonald.com/30-songs-in-30-days.html. It's fun.